The Environmental Industry Associations (EIA) has chosen Sharon H. Kneiss, a 30-year management and environmental industry veteran, to lead the association upon the retirement of the venerable Bruce Parker in June. While nobody will replace Parker, Kneiss is a proven leader and is bound to shakeup the all-boys club nature of the business. Kneiss recently served as vice president, products division with the American Chemistry Council (ACC) where she headed a 50 person staff and directed the division's strategy, promotion, advocacy and membership recruitment efforts. Prior to the ACC, Kneiss served in a management capacity at the American Forest & Paper Association, and policy advocacy roles at Chevron Corporation, Hercules Inc. and the American Petroleum Institute. The selection of Kneiss follows an extensive executive search of candidates to lead the trade association that represents the private-sector solid waste services industry and its two sub-associations, the National Solid Waste Management Association (NSWMA) and the Waste Equipment Technology Association (WASTEC). "We are pleased to announce that Sharon Kneiss will be leading the EIA effective June 1 and will bring significant insight and knowledge to our industry," said EIA Chairman Charlie Appleby. Parker is retiring after serving the EIA for 30 years as the energetic and enthusiastic face of the industry, where he waged battles on many fronts fighting for the interests of the waste industry and municipal and government entities while building bridges across an often fractious industry and educating an apathetic public, misguided politicians, and sometimes narrowly focused activists. Among his many achievements is raising public awareness of the vital importance of the industry itself, the role it plays in environmental protection and the safety of its workers. He has argued Constitutional issues before the Supreme Court and defended again and again the right of free enterprise, especially when governments or its legislators have sought to interfere. WASHINGTON, D.C. - Sharon H. Kneiss has been selected as the new president and CEO of the Environmental Industry Associations (EIA), following the retirement of Bruce Parker, who will be stepping down later this year after 30 years of successful and dedicated service to the industry. 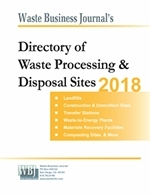 The selection of Kneiss follows an extensive executive search of candidates to lead the trade association that represents the private-sector solid waste services industry and its two sub-associations, the National Solid Waste Management Association (NSWMA) and the Waste Equipment Technology Association (WASTEC). "We are pleased to announce that Sharon Kneiss will be leading the EIA effective June 1 and will bring significant insight and knowledge to our industry," said EIA Chairman Charlie Appleby - who also serves as chairman and CEO of Advanced Disposal Services, Inc. headquartered in Jacksonville, Fla.
Kneiss, who received a Bachelor of Science in Chemistry from the University of Scranton and a Master of Business Administration from the University of Pittsburgh, has more than 30 years of business, management and advocacy experience relating to environmental policy at the federal and state levels. She served as vice president, products division with the American Chemistry Council (ACC). In this role, she managed a 50 person staff and was responsible for the division's vision and strategy, product promotion, state and local advocacy, research and policy development and membership recruitment. She also served as a public spokesperson on critical issues before Congress and high-profile media. Previously to ACC, Kneiss served in a management capacity at the American Forest & Paper Association, and policy advocacy roles at Chevron Corporation, Hercules Inc. and the American Petroleum Institute. Through that collective experience, she has spearheaded several environmental initiatives, ranging from plastic recycling to Superfund and Resource Conservation and Recovery Act (RCRA) regulatory issues to voluntary industry commitment to greenhouse gas reductions. "The CEO of EIA is the face of our environmental industry, and having the right person to fill the position upon Bruce Parker's retirement is critical," said Appleby. "The solid waste and recycling industry, including its equipment manufacturers, provides a vital service that impacts each and every person and business in this country. The needs of our customers and the development of new technologies are changing at light speed. We knew we needed someone who can readily grasp the impact of those changes and navigate the halls of Washington and the various States, as well as respond to the needs of our membership. I am confident that we found that person in Ms. Kneiss." In addressing her appointment, Kneiss said, "I am pleased and honored to take the helm of EIA, representing the industry whose services keep our communities clean, protect the public health, enable and promote recycling, integrate new technology and provide renewable energy. I look forward to representing the industry, working with its membership and working with the various governmental and non-governmental stakeholders to promote the industry's good work." 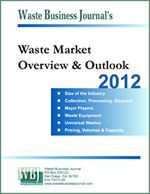 The Environmental Industry Associations (EIA) is the trade association that represents the private sector solid waste and recycling services industry through its two sub-associations, the National Solid Wastes Management Association (NSWMA) and the Waste Equipment Technology Association (WASTEC). NSWMA and WASTEC members conduct business in all 50 states and include garbage collectors, processors, recyclers, equipment manufacturers and other service providers. For more information about how innovation in the environmental services industry is helping to solve today's environmental challenges, visit environmentalistseveryday.org/environmentalists.